“Dooking” out the Summer Heat! 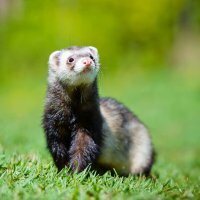 Now that the heat waves of summer are here, we thought we would give you a few tips to prevent heat stress or heatstroke in ferrets. Ferrets do not sweat like humans, therefore, cannot tolerate high temperatures. Temperatures above 75 degrees Fahrenheit can cause health problems, within hours, and anything above 90 degrees can be fatal. Being exposed to high heat levels can cause heat-related stress and weaken their immune systems. To avoid heat-related stress, keep your ferret in an air-conditioned room out of direct sunlight and provide an adequate water supply to prevent dehydration. If your ferret shows any of these symptoms, you can slowly cool down their bodies with a washcloth soaked in cool (not ice-cold) water so that it won’t shock your ferret with a drastic temperature change. Start with the paws and legs and move on to the rest of the body. Once your ferret becomes stabilized, you can safely transport your ferret to your veterinarian. Always take your ferret to your vet even though it seems okay. Ferrets may need additional treatment for dehydration and shock several hours after heat-related problems. If you’re unsuccessful or don’t feel like you can handle the above methods, contact your veterinarian for professional advice.